Let’s detail this feature, which is available for any of our reports (even triggered by our API or by our website speed monitoring feature, but also for our comparison report). 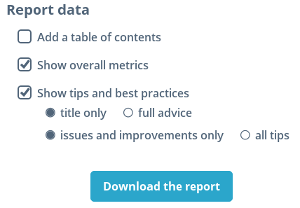 You can export any website analysis report as a PDF for free: you just have to be logged-in and to click on the “Download report” button (at the top right of the page). Then, you can check several options to customize the PDF report, according to your needs. By activating the overall metrics, you will highlight the speed test results. By activating the tips and best practices, you will integrate the quality checkpoints results. Moreover, you can choose to only display the titles (eg: if you want a checklist), or get the full advice describing how to fix the issues. Finally, you can choose to hide the successful checkpoints in order to show only the improvements and problems. 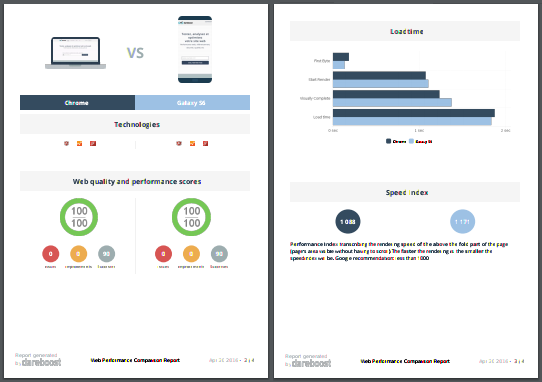 Below you can see a PDF comparison report (do not hesitate to download this sample report). Freelancers, web agencies and SEO agencies: good news for you, a white label option is available! Whether during the pre-sales, a website redesign or the acceptance phase of a project, the white label feature will enable you to deliver a high value document to your customers, in a flash. There are a lot of use cases, and the several options that we have outlined above will allow you to get a report complying by them. For instance, you can show a prospect how his website is doing compared to its main competitor, or provide a working checklist to your technical partner. These are just some examples, do not hesitate to contact us if you have any question. It is possible to add your own logo on the flyleaf of the PDF and within the footer of all the pages. A free text area also lets you define an introduction. Then, up to you to update these elements according to your needs! How to enjoy the white label feature? Check our professional plans and choose one offering this feature. You can also compose a custom plan! Are your needs punctual? Download a PDF directly from an existing report: you can choose the white label option, which will be charged to the unit price of 15€.